Katappa reveals why he killed Baahubali. Finally!!! After the stupendous success of Baahubali: The Beginning, one question that has been bothering the audience is, 'Why Katappa Killed Baahubali?' The impact of the film was so much that several fan theories, which surfaced online, tried to solve the mystery. 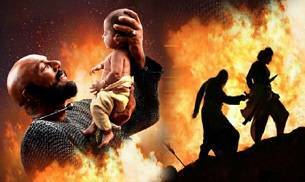 Ahead of the release of Baahubali 2, veteran Tamil actor Sathyaraj, who plays Katappa in the film, has finally revealed why he killed Baahubali. Speaking at the event, Sathyaraj said, "Producer Shobu paid me very well to kill Prabhas. My director Rajamouli asked me to kill Baahubali, and I obliged. Why would I kill Prabhas otherwise?" Despite having acted in over 250 films, Sathyaraj said that the word knows him as Katappa, the slave warlord who killed Baahubali. At the event, SS Rajamouli, lead actors- Prabhas, Rana, Anushka, Tamannaah, Sathyaraj, Nasser and Ramya Krishnan clicked 'The Baahubali 2' selfie along with Karan, which went viral on the internet. Made on a budget of Rs 200 crore, reports suggested that Baahubali 2 has raked in Rs 500 crore globally through its satellite and distribution rights before the film's release. Baahubali 2 trailer was released last week, which received overwhelming response from fans across the world. Also starring Prabhas, Rana Daggubati, Anushka Shetty, Tamannaah, Sathyaraj and Nassar, Baahubali: The Conclusion will hit the screens on April 28.